About the Book: Bartholomew is pretty ordinary and a bit bored. So when a very big wind appears outside his window, Bartholomew takes his bedsheet and soars into the sky. Flying across the world, Bartholomew meets new friends and has many wild adventures. 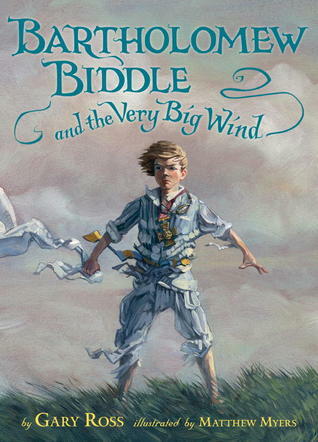 GreenBeanTeenQueen Says: Told in rhyming verse, Bartholomew Biddle would make a great pick for poetry month lessons. The story is broken up into seven chapters and while they all work together, each chapter also holds a small vignette of adventure that is happening to Bartholomew. The rhyming verse would make this a great read aloud for families reading together. I really appreciated that I never felt like the rhyming lines were forced. The flow was always very well done and the rhymes worked. It also gave the book a nice cadence. Bartholomew has several fun adventures along the way and I think readers who love stories full of imagination will love Bartholomew. I love that the book features a note to grown-ups about explaining to kids that no one can fly with a bedsheet. The book is a bit long and sometimes the format breaks up a sentence in the middle which could be a bit distracting, but overall I really enjoyed it. The illustrations add to the story and I loved seeing pictures of Bartholomew's new friends and locations he discovers along the way. Bartholomew is a great character and his adventures are reminiscent of classic children's stories that I think adults will feel nostalgic while reading and kids will enjoy the high stakes of flying with a bedsheet across the world. A fun read that's perfect for all ages. Sounds fun. And it's nice to see that rhyming verse books are still going strong.